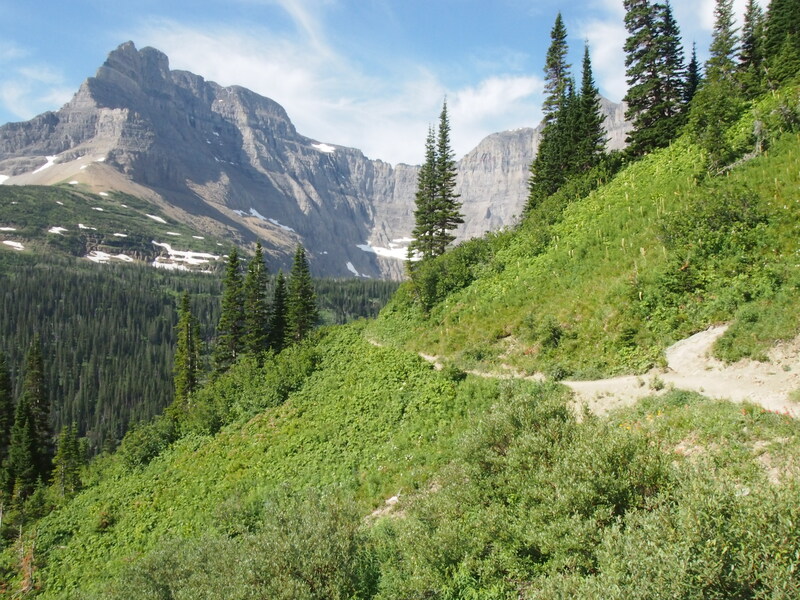 Day 23, Many Glacier Campground to St. Mary Campground: 21.5 miles, 937 ft. elevation gain, 15.1 mph average speed. We’re thrilled to get back on the road. It just feels right to be biking again. 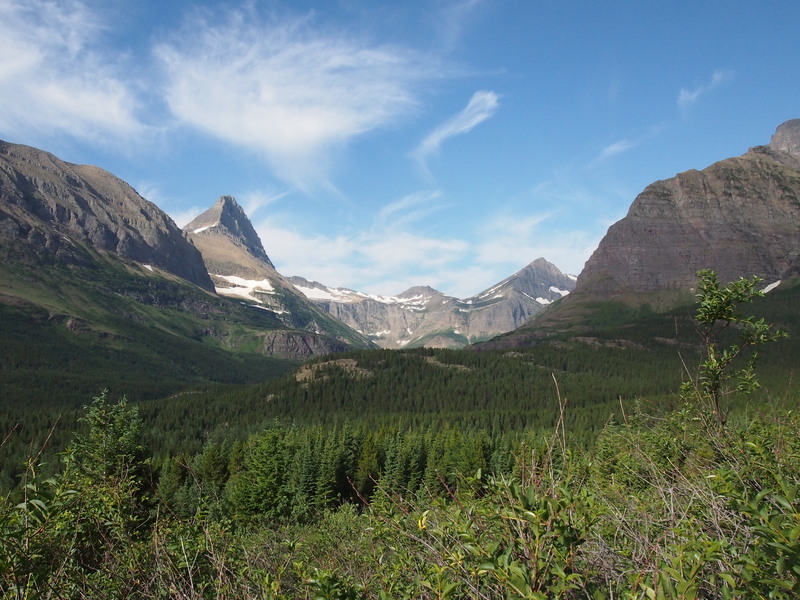 Before I get started, let’s recap the last few days of being stranded at Many Glacier. Our third day, we took a 10-mile hike to see the aptly named Iceberg Lake. The hike was very nice, but it had a lot to live up to after Grinell Glacier (which I think is the most beautiful hike I’ve ever been on). 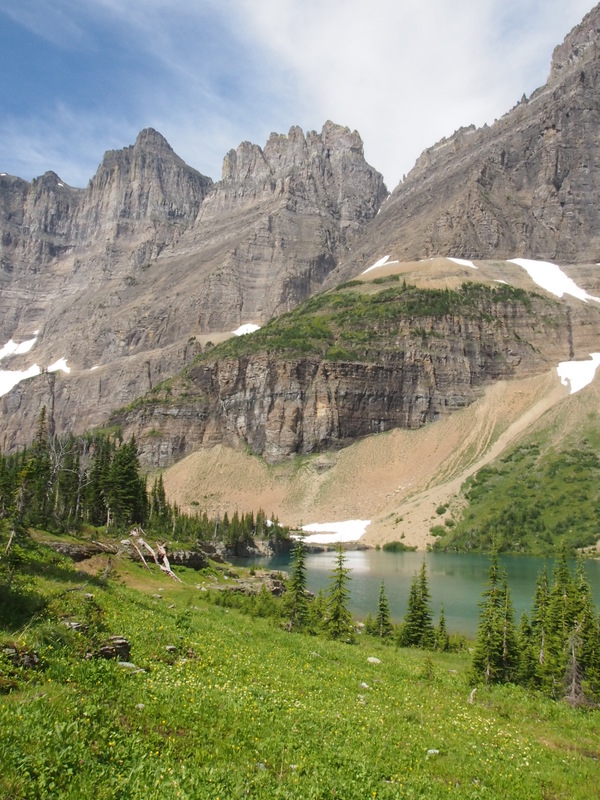 The nice thing about the hike to Iceberg Lake was that the entire hike had a mild, steady grade. 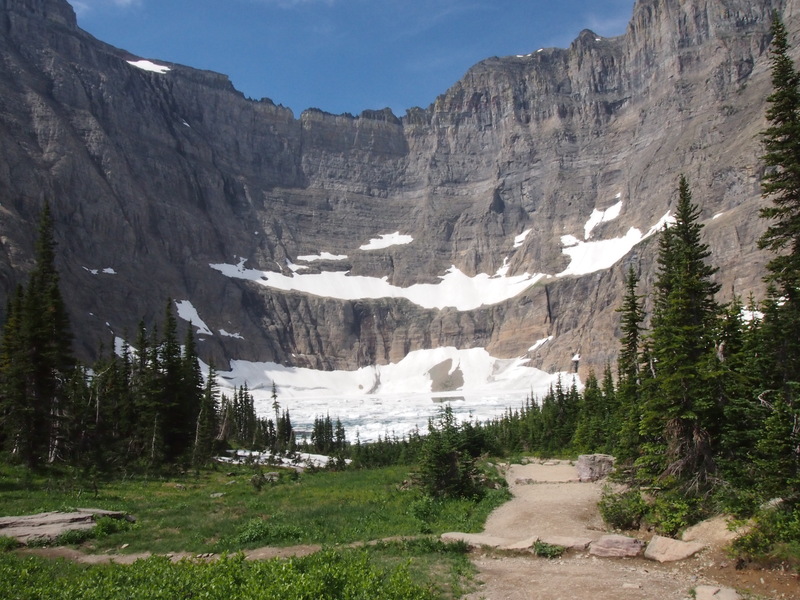 The downside of that is that the gentle grade makes it a very popular hike and we didn’t have any of the solitude we had on the Grinell Glacier hike. The other downside of this hike is that two long hikes in three days without proper footwear left Dani with a severely aching foot. Turns out it began hurting on the Grinnell hike, but Dani didn’t complain much because she knew I wouldn’t let her hike on a gimpy foot. 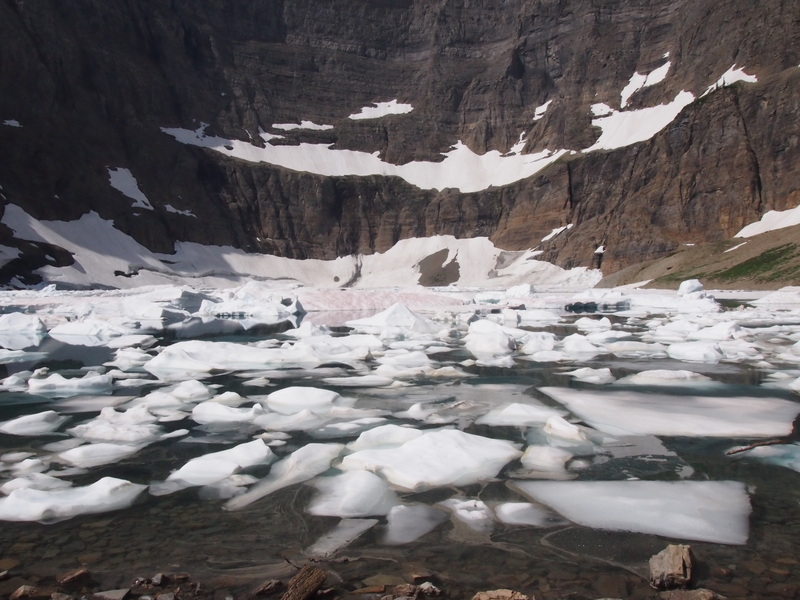 It got so bad on the Iceberg Lake hike that she ended up limping more than half the way down. We couldn’t quite figure out what it was, but we’re leaning toward some sort of tendinitis related to not having proper arch support. Luckily, the foot doesn’t hurt much while she’s biking, but it’s still no fun. Dani, of course, tried to pretend that nothing was wrong. We saved the hike that she was most looking forward to for last and she was determined to do it, even only on one foot. She struggled to walk to the bathroom, but did her best to convince me that the 13-mile hike to Cracker Lake would be no problem at all. I’m pretty gullible, but even I wasn’t falling for that one. These days ended up about how one would expect given our strandedness in a National Park with one broken bike and one hurt foot. Lots of sitting. Lots of reading. Lots of sitting on the Swiftcurrent Inn porch drinking chocolate milk, lemonade, and beer. A few trips down to the fancier Many Glacier Hotel to sit by the fire, work on a puzzle, and drink chai. At this point, we were rather stir crazy. We just wanted to get back on the road. The big day! It was a pretty stressful morning and early afternoon. The wheel made it to a town two hours away at 7:15a, and then there were no further tracking updates. I would walk up to the inn every half hour or so to check, and each time I was more and more convinced that we would end up spending another day at the campground. But when I checked at 3:00p, it was delivered! In shocked disbelief, I rushed to tell Dani and we hurriedly broke camp and packed up our bikes. We rode the mile down to the hotel to get the wheel. All that was left was installation. The magical J.A. 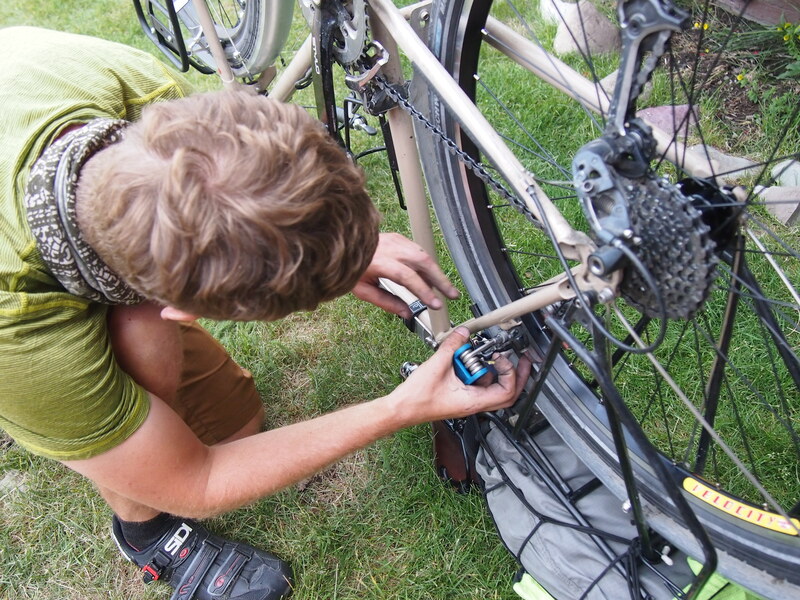 Stein Mini Lockring Driver leverages the pedaling motion of the bike against the bike frame to unscrew and reattach the cassette lockring. I think I might do a post sometime about my bike tool kit, but for now I just want to mention that no one should head out on a bike tour without the J.A. Stein Mini Lockring Driver. Thirty-five bucks might seem like a lot for a “just in case” tool, but it saved my bacon here. Without this tool, even once I received the wheel, I wouldn’t have been able to transfer my cassette from the broken wheel to the new wheel. 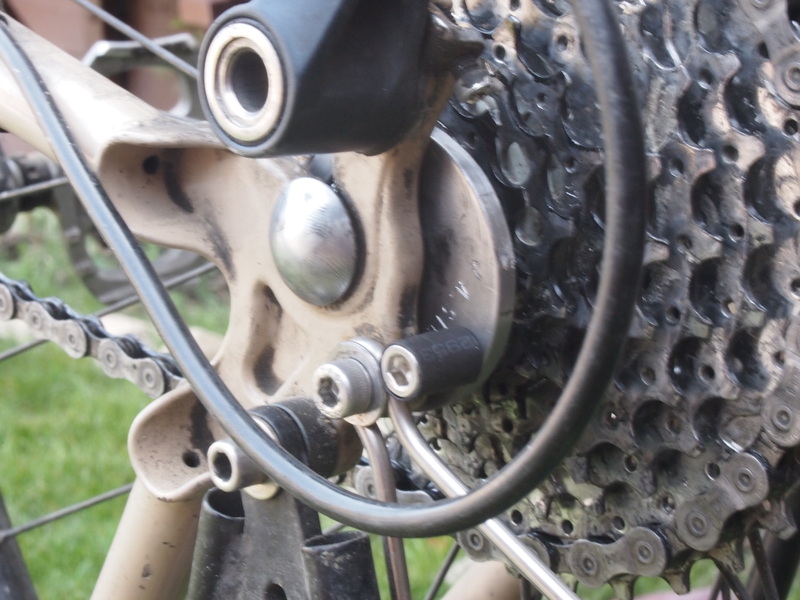 Also, if you happen to break a spoke on the driveside of your rear wheel, you need to be able to take off the cassette in order to fix it. Thanks to that tool, I got the new wheel installed. 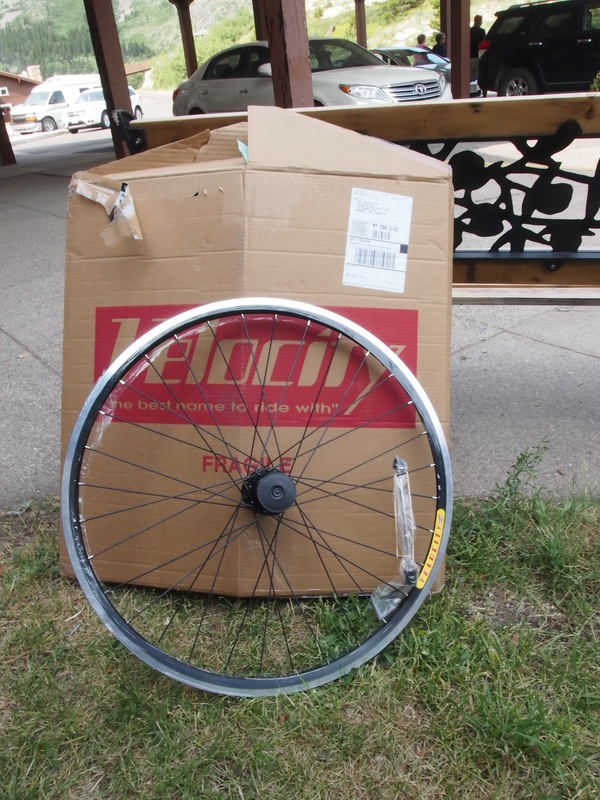 Now, I’m eternally grateful to Velocity for sending me a new wheel completely free of charge. But if I was going to pick a few nits, they would be 1) I had a 36 spoke wheel, and they sent me a 32 spoke wheel, which is a marginal but still measurable reduction in wheel strength, and 2) they only had a disc brake hub, and my bike has rim brakes. I’m pretty sure I’ve read that you shouldn’t run rim brakes on a disc brake wheel, but I can make it through the trip avoiding my rear brakes. I don’t like using brakes anyway. They’re inefficient! Once the wheel was installed and all the bags were packed, we started off. Wanna know what’s fun? Riding down a gentle downhill slope with a big ol’ tailwind. We just flew down the road. We made it to Two Sisters (17 miles) in less than an hour, and we couldn’t resist stopping for another piece of that peanut butter huckleberry pie. And dinner too, I suppose. The food was still great, but unfortunately the service was pretty terrible. The server was rude to us from the beginning. He rolled his eyes when we didn’t order drinks, never refilled our water without me doing everything short of grabbing onto his apron as he hustled by, and then ended the meal by coming over to our table and saying, “I’m not trying to kick you guys out, but there are people waiting for a table. I’m just saying. It’s up to you. Do what you want. Whatever.” Important detail: at least a third of the tables at the restaurant arrived before us, but no one else got un-kicked out kicked out. I’d say how I felt about this guy, but this is a family blog. it was disappointing to have a place we enjoyed so much let us down, but there was a fun part of dinner, too! A fellow bike tourist saw our bikes outside, walked into the full restaurant, scanned the patrons and immediately picked us out of the crowd (perhaps we should be embarrassed by this?). We chatted (for too long, apparently; there are people waiting after all) about our trips. 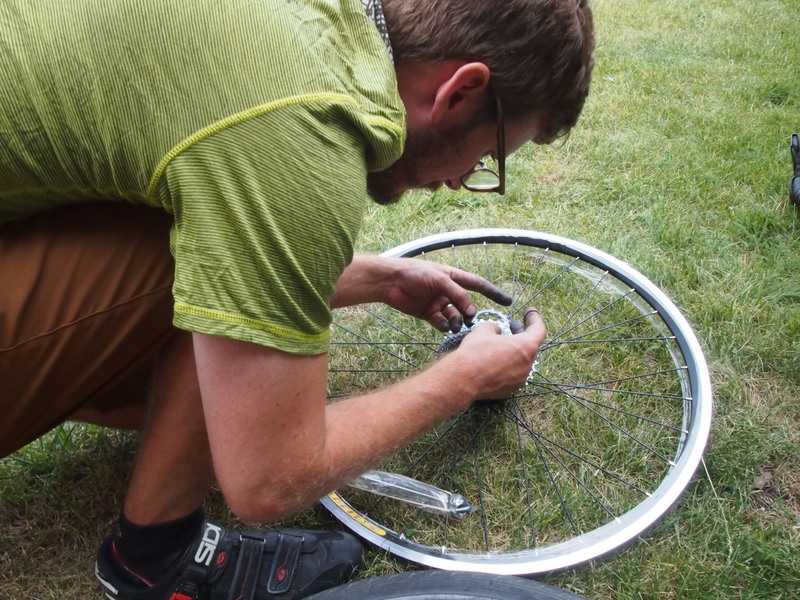 He’s a teacher in Richmond, Virginia, and uses his summers off to bike tour. What a life! He also had some of the coolest handlebars I’ve ever seen on a bike. I can’t find the exact setup he said he had, but it looked something like this. Next time I build up a touring bike, that’s what’s going on it. After Two Sisters, we rode the rest of the way back to St. Mary Campground, where we fought through swarms of mosquitos to pitch our tent. We were sharing the campground with a couple who riding from Banff to Mexico, off-road, on the Great Divide trail. As we meet other bike tourists, I always enjoy seeing how other people set up their bikes. These guys had three-inch tires (twice as wide as Dani’s tires) and that Rolhoff speed hub I’ve been dreaming about. And I may or may not have embarrassed myself gushing over it. Anyway, we hopped into the tent and tried to fall asleep asleep as quick as possible. Tomorrow is a big day! We need to start making up lost time!